The nanoparticles start out relatively large — 100 nanometers wide — so that they can move through the bloodstream and smoothly transport into the tumor through leaky blood vessels. As they detect acidic conditions close to tumors, the nanoparticles discharge “bomblets” just 5 nanometers in size to penetrate tumor cells. Once inside tumor cells, the bomblets release the platinum-based cisplatin, which kills by crosslinking and damaging DNA. Doctors have used cisplatin to fight several types of cancer for decades, but toxic side effects — to the kidneys, nerves and inner ear — have limited its effectiveness. But in research with three different mouse tumor models*, the researchers have now shown that their nanoparticles can enhance cisplatin drug accumulation in tumor tissues for several types of cancer. Details of the research — by teams led by professor Jun Wang, PhD, at the University of Science and Technology of China and by professor Shuming Nie, PhD, in the Wallace H. Coulter Department of Biomedical Engineering at Georgia Tech and Emory — were published this week in the journal PNAS. * When mice bearing human pancreatic tumors were given the same doses of free cisplatin or cisplatin clothed in pH-sensitive nanoparticles, the level of platinum in tumor tissues was seven times higher with the nanoparticles. This suggests the possibility that nanoparticle delivery of a limited dose of cisplatin could restrain the toxic side effects during cancer treatment. The researchers also showed that the nanoparticles were effective against a cisplatin-resistant lung cancer model and an invasive metastatic breast cancer model in mice. In the lung cancer model, a dose of free cisplatin yielded just 10 percent growth inhibition, while the same dose clothed in nanoparticles yielded 95 percent growth inhibition, the researchers report. In the metastatic breast cancer model, treating mice with cisplatin clothed in nanoparticles prolonged animal survival by weeks; 50 percent of the mice were surviving at 54 days with nanoparticles compared with 37 days for the same dose of free cisplatin. A principal goal of cancer nanomedicine is to deliver therapeutics effectively to cancer cells within solid tumors. However, there are a series of biological barriers that impede nanomedicine from reaching target cells. Here, we report a stimuli-responsive clustered nanoparticle to systematically overcome these multiple barriers by sequentially responding to the endogenous attributes of the tumor microenvironment. The smart polymeric clustered nanoparticle (iCluster) has an initial size of ∼100 nm, which is favorable for long blood circulation and high propensity of extravasation through tumor vascular fenestrations. Once iCluster accumulates at tumor sites, the intrinsic tumor extracellular acidity would trigger the discharge of platinum prodrug-conjugated poly(amidoamine) dendrimers (diameter ∼5 nm). Such a structural alteration greatly facilitates tumor penetration and cell internalization of the therapeutics. The internalized dendrimer prodrugs are further reduced intracellularly to release cisplatin to kill cancer cells. The superior in vivo antitumor activities of iCluster are validated in varying intractable tumor models including poorly permeable pancreatic cancer, drug-resistant cancer, and metastatic cancer, demonstrating its versatility and broad applicability. Hong-Jun Li, Jin-Zhi Du, Xiao-Jiao Du, Cong-Fei Xu, Chun-Yang Sun, Hong-Xia Wang, Zhi-Ting Cao, Xian-Zhu Yang, Yan-Hua Zhu, Shuming Nie, and Jun Wang. 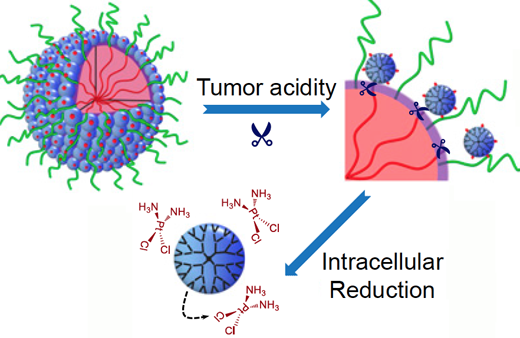 Stimuli-responsive clustered nanoparticles for improved tumor penetration and therapeutic efficacy. The facts suggest that big pharma represents only a few companies in most fields of disease. They spend an enormous amount of money in lobbying congress and doctors to get them to do their bidding.They wouldn’t spend the money if they didn’t need to do so.The profit motive is central with patient well being only being practiced if it pays off.Cancer is a superb example, with new drugs being offered usually at astronomical prices in this country. Like wise the FDA is controlled by them and it is in their best interests to make the cost of developing new drugs outrageously expensive.Only big pharma can afford to get new drugs approved. After the phase 3 trials are completed usually the documentation to ask for approval to market a drug is at least 100,000 pages long. The legal talent needed to compile such documents ( and this is only one of many documents produced in the process) is extremely expensive. The time taken for approval stretches into many years and then the drugs are often not approved. (only a small percentage are approved). Antibiotics were one example of a group of drugs that really did cure many diseases. Big pharma found it didn’t pay to develop new antibiotics because the treatment was short and so successful that patients used the drugs only for a short time. Over time, as Alexander Fleming forsaw, the bacteria would develop resistance, especially if they were extensively used indiscriminantly. Now many dangerous bacteria are resistant to many or all antibiotics and there is no treatment available. Since bacteria can pass this resistance to specific antibiotics to almost any species of bacteria, its only a matter of time before we will be back in the pre-antibiotic era. SINCE IT DOES NOT PAY FOR BIG PHARMA TO DEVELOP NEW ANTIBIOTICS THEY ARE NOW NOT DOING SO AT ALL. I’m not so convinced after all. But this is perfectly in line with big pharma goals. Only an idiot would kill its main source of income. It is almost impossible to set up a conspiracy against big pharma’s abusive practices.Every avenue their high priced lawyers can think of to stop budding conspiracies has been blocked by law where possible. One possible road might be to do research and development in other countries outside US legal juristiction, however most drugs without FDA approval can and are stopped at the border and confiscated even if as in Canada the same drug produced in the US is being manufactured in Canada.Almost certainly Cisplatin is under patent in the US and the patent holder has the right to refuse the use of the drug for any reason they want, including being used in this cluster bomb drug. The manufacturer is almost certainly making huge profits from selling Cisplatin and I doubt they want to see a cheap drug cure many cancers. I guess the only way to go is to try and turn to a country like India.A number of cancer drugs were being sold by US patent holders at wholesale prices that were to high for most Indians. The government of India refused to allow these companies to patent their medicines in India and forced them to license the drugs and much cheaper prices.Most US patents are not operative in India, they can produce US style insulin pumps at a fraction of our cost as they can in China and Vietnam or Mexico. It would be difficult to send these pumps to buyers in the US from India but by shipping them from another country, say Canada or Mexico most would make it past customs. As for Cancer treatment, India and china have some very fine trained biochemist and doctors, who could easily apply many of the immunological treatments against cancer. All arms of the immune system have been used to produce miracle treatments that have cured some patients that were on their death beds.The treatments can be tested carefully in these countries, and improved by any methods including some I have suggested.By advertising in the US to cancer patients that they can inexpensively have these working treatments cheaply as a medical tourist, it is only a matter of time before they will cure the disease wholesale and break the medical industrial complex down. As far as generics that are not being produced here, by setting up a non profit corporation that produces any and all drugs that come off patent as a goal, at the cheapest price less a reasonable markup for cost of manufacture etc. one by one they will end the abuse of not producing or overpricing generics. Successively overcoming a series of biological barriers that cancer nanotherapeutics would encounter upon intravenous administration is required for achieving positive treatment outcomes. A hurdle to this goal is the inherently unfavorable tumor penetration of nanoparticles due to their relatively large sizes. We developed a stimuli-responsive clustered nanoparticle (iCluster) and justified that its adaptive alterations of physicochemical properties (e.g. size, zeta potential, and drug release rate) in accordance with the endogenous stimuli of the tumor microenvironment made possible the ultimate overcoming of these barriers, especially the bottleneck of tumor penetration. Results in varying intractable tumor models demonstrated significantly improved antitumor efficacy of iCluster than its control groups, demonstrating that overcoming these delivery barriers can be achieved by innovative nanoparticle design. Engineering of self-assembled nanoparticle platform for precisely controlled combination drug therapy. Enhanced anticancer activity of nanopreparation containing an MMP2-sensitive PEG-drug conjugate and cell-penetrating moiety. Protein-assisted self-assembly of multifunctional nanoparticles. Photoswitchable nanoparticles for in vivo cancer chemotherapy. Investigating the optimal size of anticancer nanomedicine. Tufts University biologists have demonstrated (using a frog model*) for the first time that it is possible to prevent tumors from forming (and to normalize tumors after they have formed) by using optogenetics (light) to control bioelectrical signalling among cells. Virtually all healthy cells maintain a more negative voltage in the cell interior compared with the cell exterior. But the opening and closing of ion channels in the cell membrane can cause the voltage to become more positive (depolarizing the cell) or more negative (polarizing the cell). That makes it possible to detect tumors by their abnormal bioelectrical signature before they are otherwise apparent. The study was published online in an open-access paper in Oncotarget on March 16. The use of light to control ion channels has been a ground-breaking tool in research on the nervous system and brain, but optogenetics had not yet been applied to cancer. The researchers first injected cells in Xenopus laevis (frog) embryos with RNA that encoded a mutant RAS oncogene known to cause cancer-like growths. The researchers then used blue light to activate positively charged ion channels,which induced an electric current that caused the cells to go from a cancer-like depolarized state to a normal, more negative polarized state. The did the same with a green light-activated proton pump, Archaerhodopsin (Arch). Activation of both agents significantly lowered the incidence of tumor formation and also increased the frequency with which tumors regressed into normal tissue. “These electrical properties are not merely byproducts of oncogenic processes. They actively regulate the deviations of cells from their normal anatomical roles towards tumor growth and metastatic spread,” said senior and corresponding author Michael Levin, Ph.D., who holds the Vannevar Bush chair in biology and directs the Center for Regenerative and Developmental Biology at Tufts School of Arts and Sciences. This work was supported by the G. Harold and Leila Y. Mathers Charitable Foundation. * Frogs are a good model for basic science research into cancer because tumors in frogs and mammals share many of the same characteristics. These include rapid cell division, tissue disorganization, increased vascular growth, invasiveness and cells that have an abnormally positive internal electric voltage. It has long been known that the resting potential of tumor cells is depolarized relative to their normal counterparts. More recent work has provided evidence that resting potential is not just a readout of cell state: it regulates cell behavior as well. Thus, the ability to control resting potential in vivo would provide a powerful new tool for the study and treatment of tumors, a tool capable of revealing living-state physiological information impossible to obtain using molecular tools applied to isolated cell components. Here we describe the first use of optogenetics to manipulate ion-flux mediated regulation of membrane potential specifically to prevent and cause regression of oncogene-induced tumors. Injection of mutant-KRAS mRNA induces tumor-like structures with many documented similarities to tumors, in Xenopus tadpoles. We show that expression and activation of either ChR2D156A, a blue-light activated cation channel, or Arch, a green-light activated proton pump, both of which hyperpolarize cells, significantly lowers the incidence of KRAS tumor formation. Excitingly, we also demonstrate that activation of co-expressed light-activated ion translocators after tumor formation significantly increases the frequency with which the tumors regress in a process called normalization. These data demonstrate an optogenetic approach to dissect the biophysics of cancer. Moreover, they provide proof-of-principle for a novel class of interventions, directed at regulating cell state by targeting physiological regulators that can over-ride the presence of mutations. An optical sensor that’s 1 million times more sensitive than the current best available has been developed by Case Western Reserve University researchers. Based on nanostructured metamaterials, it can identify a single lightweight molecule in a highly dilute solution.The research goal is to provide oncologists a way to detect a single molecule of an enzyme produced by circulating cancer cells. That could allow doctors to diagnose and monitor patients with certain cancers far earlier than possible today. “The prognosis of many cancers depends on the stage of the cancer at diagnosis,” said Giuseppe “Pino” Strangi, professor of physics at Case Western Reserve and research leader. “Very early, most circulating tumor cells express proteins of a very low molecular weight, less than 500 Daltons,” Strangi explained. “These proteins are usually too small and in too low a concentration to detect with current test methods, yielding false negative results. The researchers believe the sensing technology will also be useful in diagnosing and monitoring other diseases. The nanosensor, which fits in the palm of a hand, acts like a biological sieve, capable of isolating a small protein molecule weighing less than 800 quadrillionths of a nanogram from an extremely dilute solution. To make the device so sensitive, Strangi’s team faced two long-standing barriers: Light waves cannot detect objects smaller than their own physical dimensions (about 500 nanometers, depending on wavelength). And molecules in dilute solutions float in Brownian (random) motion and are unlikely to land on the sensor’s surface. “It’s extremely sensitive,” Strangi said. “When a small molecule lands on the surface, it results in a large local modification, causing the light to shift.” Depending on the size of the molecule, the reflecting light shifts different amounts. The researchers hope to learn to identify specific biomarker and other molecules for different cancers by their light shifts. To add specificity to the sensor, the team added a layer of trap molecules — molecules that bind specifically with the molecules they hunt. In tests, the researchers used two trap molecules to catch two different biomolecules: bovine serum albumin, with a molecular weight of 66,430 Daltons, and biotin, with a molecular weight of 244 Daltons. Each produced a signature light shift. Other researchers have reported using plasmon-based biosensors to detect biotin in solutions at concentrations ranging from more than 100 micromoles per liter to 10 micromoles per liter. This device proved 1 million times more sensitive, finding and identifying biotin at a concentration of 10 picomoles per liter. Strangi’s lab is working with other oncologists worldwide to test the device and begin moving the sensor toward clinical use. In Cleveland, Strangi and Nima Sharifi, MD, co-leader of the Genitourinary Cancer Program for the Case Comprehensive Cancer Center, have begun testing the sensor with proteins related to prostate cancers. “For some cancers, such as colorectal and pancreatic cancer, early detection is essential,” said Sharifi, who is also the Kendrick Family Chair for Prostate Cancer Research at Cleveland Clinic. “High sensitivity detection of cancer-specific proteins in blood should enable detection of tumors when they are at an earlier disease stage. The research is published online in the journal Nature Materials. * The top gold layer is perforated with holes, creating a grating that diffuses light shone on the surface into two dimensions. The incoming light, which is several hundreds of nanometers in wavelength, appears to be confined and concentrated in a few nanometers at the interface between the gold and the dielectric layer. As the light strikes the sensing area, it excites free electrons causing them to oscillate and generate a highly confined propagating surface wave, called a surface plasmon polariton. This propagating surface wave will in turn excite a bulk wave propagating across the sensing platform. The presence of the waves cause deep sharp dips in the spectrum of reflecting light. The combination and the interplay of surface plasmon and bulk plasmon waves are what make the sensor so sensitive. Strangi said. By exciting these waves through the eight bilayers of the metamaterial, they create remarkably sharp resonant modes. Extremely sharp and sensitive resonances can be used to detect smaller objects. Optical sensor technology offers significant opportunities in the field of medical research and clinical diagnostics, particularly for the detection of small numbers of molecules in highly diluted solutions. Several methods have been developed for this purpose, including label-free plasmonic biosensors based on metamaterials. However, the detection of lower-molecular-weight (<500 Da) biomolecules in highly diluted solutions is still a challenging issue owing to their lower polarizability. 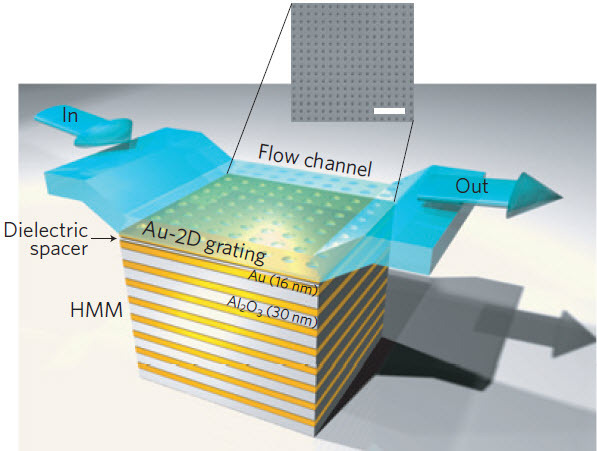 In this context, we have developed a miniaturized plasmonic biosensor platform based on a hyperbolic metamaterial that can support highly confined bulk plasmon guided modes over a broad wavelength range from visible to near infrared. By exciting these modes using a grating-coupling technique, we achieved different extreme sensitivity modes with a maximum of 30,000 nm per refractive index unit (RIU) and a record figure of merit (FOM) of 590. We report the ability of the metamaterial platform to detect ultralow-molecular-weight (244 Da) biomolecules at picomolar concentrations using a standard affinity model streptavidin–biotin. Aptamers are a class of small nucleic acid ligands that are composed of RNA or single-stranded DNA oligonucleotides and have high specificity and affinity for their targets. Similar to antibodies, aptamers interact with their targets by recognizing a specific three-dimensional structure and are thus termed “chemical antibodies.” In contrast to protein antibodies, aptamers offer unique chemical and biological characteristics based on their oligonucleotide properties. Hence, they are more suitable for the development of novel clinical applications. Aptamer technology has been widely investigated in various biomedical fields for biomarker discovery, in vitro diagnosis, in vivo imaging, and targeted therapy. This review will discuss the potential applications of aptamer technology as a new tool for targeted cancer therapy with emphasis on the development of aptamers that are able to specifically target cell surface biomarkers. Additionally, we will describe several approaches for the use of aptamers in targeted therapeutics, including aptamer-drug conjugation, aptamer-nanoparticle conjugation, aptamer-mediated targeted gene therapy, aptamer-mediated immunotherapy, and aptamer-mediated biotherapy. The terms “aptamer” and “SELEX” were introduced by two independent groups in 1990.1,2 The term “aptamer” refers to small nucleic acid ligands that exhibit specific therapeutic functions and an unambiguous binding affinity for their targets. Conversely, Systematic Evolution of Ligands by EXponential enrichment (SELEX) technology is the method used for aptamer development. Although using small molecule nucleic acids as therapeutics has been explored for decades, development of SELEX and aptamer technology revolutionized this field. Schematic diagram of aptamer binding to its target. Since aptamer technology was first introduced, the RNA-based sequence library has been widely used for SELEX. Based on the existing evidence, it is believed that the presence of a 2′-OH group and non-Watson-Crick base pairing allows RNA aptamer oligonucleotides to fold into more diverse 3D structures than ssDNA molecules. Consequently, using the more flexible RNA sequences simplifies the development of high-affinity and -specificity aptamers. Despite their advantages, RNA sequences are very sensitive to nucleases present in biological environments and can be rapidly degraded.18 To increase nuclease resistance of RNA-based aptamers, several chemical modifications have been investigated. Evidence shows that 2′-OH group and phosphodiester linkages of RNA sequences are the sites of nuclease hydrolysis. Subsequently, substitutions of the 2′-OH functional group by 2′-fluoro, 2′-amino, or 2′-O-methoxy motifs, and/or changes to the phosphodiester backbone with boranophosphate or phosphorothioate are the most common modifications aimed at increasing nuclease resistance.19 More recently, Wu et al. developed a novel chemical modification method to increase siRNA stability, in which phosphorodithioate and 2′-O-Methyl were simultaneously substituted in the same nucleotide.20 This modification method significantly enhanced siRNA stability and represents a potential new direction for utilization of RNA-based therapies in complex biological systems. Other effective modifications recently reported utilize the locked nucleic acid technology16,21 or generate “mirror” RNA sequence structures, termed spiegelmers.22 These modifications result in structural changes to the RNA sequences, which cannot be digested by nucleases. In summary, unique chemical features and biological functions have made aptamers a very attractive tool in biomedical research over the past two decades. Currently, there are over 4,000 published articles referenced in the PubMed database that include the term “aptamer.” Research areas that include aptamer technology cover bioassays, drug development, cell detection, tissue staining, in vitro and in vivoimaging, nanotechnology, and targeted therapy. As chemical antibodies, aptamers represent an excellent alternative to replace or supplement protein antibodies, which have been extensively used in the clinic. 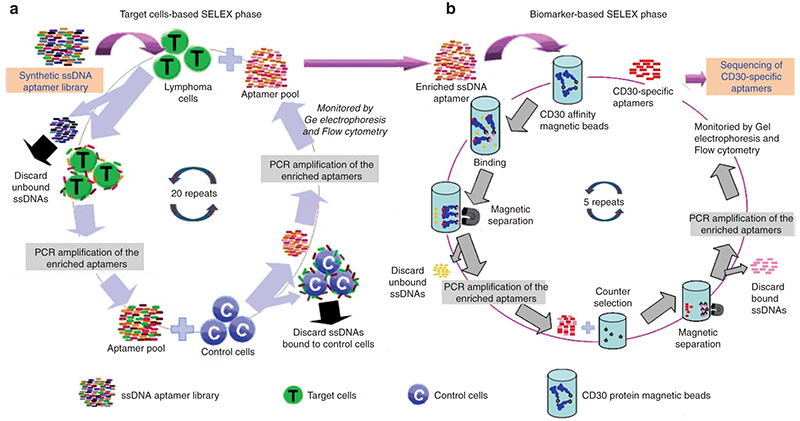 Schematic diagram of our hybrid-SELEX method for selection of CD30-specific ssDNA aptamer. In our experiment, the hybrid-SELEX process is divided into (a) the cell-based SELEX selection and (b) CD30 protein-based SELEX enrichment. First, CD30-expressing lymphoma cells are used for positive selection and CD30-negative Jurkat cells are used in negative counter-selection. After 20 rounds of selection, the enriched aptamer pool is incubated with CD30 protein immobilized on magnetic beads for five additional rounds of enrichment. SELEX, Systematic Evolution of Ligands by EXponential enrichment. Aptamer-based biotherapy. (a) Schema showing receptor oligomerization-inducing downstream signaling. CD30-associated signaling is activated by its ligand through trimerization of the receptor, leading to varied outcomes that range from apoptosis to proliferation. (b) CD30-positive and -negative cells were incubated without any treatment or in the presence of control streptavidin, monomeric aptamer, and multimeric aptamer. 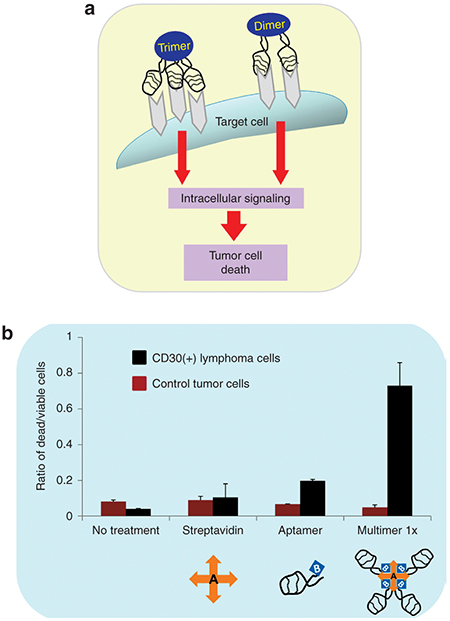 Following 72-hour incubation, the multivalent CD30 aptamer induced cell death in the CD30-positive lymphoma cells, but had no effect on the CD30-negative control cells. Ratio of the dead/live cells was calculated by costaining the cells with Hoechst 33342 (live cells) and propidium iodide (dead cells). Antibody-based targeted therapeutics provide high target specificity and affinity. However, their potential for immunogenicity is of a great concern, as is their high production cost, both of which have limited their clinical applicability. As discussed in this review, when compared to protein antibodies, oligonucleotide aptamers offer many advantages, including simple chemical synthesis, virtual nonimmunogenicity, smaller size, faster tissue penetration, ease of modification with different functional moieties, low cost of production, and high biological stability. Therefore, aptamers have become a promising new class of molecular ligands that could replace or supplement protein antibodies. In summary, aptamer technology has a strong market value and may be applied in various biomedical fields, including in vitro cancer cell detection, in vivo tumor imaging, and targeted cancer therapy (Figure 7). Although aptamer technology has a great potential in the biomedical field, several technical challenges remain and must be addressed. These include: (i) how can aptamers be rapidly adapted for specific targets by decreasing false-positive/-negative selection? Primarily dependent on the natural properties of targets of interest, such as proteins versus cells or tissues, the process of aptamer selection is usually time-consuming, and the success rate is sometimes low. To improve the speed and success rate, novel methods for aptamer selection have been recently described. They include bead-based selection, that can select aptamers as rapidly as a single round of selection,27,28 and the SOMAmer, which improves the aptamer production success rate from less than 30% to over 50%.29,30 More recently, a study by Cho et al.devised a Quantitative Parallel Aptamer Selection System (QPASS) method, which integrates microfluidic selection, NGS, and in situ-synthesized aptamer arrays. This approach allows for the simultaneous measurement of affinity and specificity for thousands of candidate aptamers in parallel.116 In addition to QPASS, evolving modifications to the Cell-SELEX approach are beginning to address difficulties with successful removal of the influence stemming from the presence of dead cells, slow enrichment aptamers recognizing targets of interest, and contamination with unwanted aptamer sequences. As described above, utilization of the above-mentioned FACS-mediated SELEX44,45and hybrid-SELEX23 offers novel approaches that address these technical challenges. (ii) How can we select cancer-relevant targets for aptamer development and clinical applications? Tumorigenesis is a dynamic process that includes multiple constantly changing factors. Therefore, a one-size-fits-all cancer-specific biomarker is unlikely to ever be identified. Yet, it has been established that certain biomarkers present in healthy tissues are highly expressed in cancer cells. Moreover, certain biomarkers are associated with particular cancer cell types making them to be considered as useful targets for development of targeted cancer therapy. However, while use of cancer cells to identify biomarkers and to develop therapeutic agents is a reasonable approach, cultured cells, especially immortalized cell lines, greatly differ from tumor tissues in vivo. To overcome these limitations and to select more reliable cancer-relevant biomarkers for aptamer development, several innovative SELEX methods have been recently described. Of particular interest are the tissue-based SELEX117 and the in vivo-SELEX,118 which offer target selection under more relevant pathologic conditions. This cell/tissue-specific biomarker selection can also be utilized for development of noncancer related therapies, as shown for aptamers targeting the adipose tissue in obesity119 and for aptamers designed to penetrate the blood-brain barrier in order to combat brain diseases.120 Hence, we believe that the careful selection of cancer-associated biomarkers and cell/tissue type-specific biomarkers will expand the scopes of aptamer applicability and improve the feasibility of clinical applications. (iii) What methods could improve aptamer biostability in vivo? Unmodified RNA-based aptamers are very susceptible to the nuclease-mediated degradation in vivo. Although many chemical modifications aimed at increasing biostability of the RNA aptamers have been developed, including 2′-modifications, 3′-modifications, phosphodiester backbone modifications,19,20 and utilizations of novel nucleic acids (locked nucleic acid and Spiegelmers),16,21,22 their effectiveness is still limited. When it was first described, PEGylation was a very attractive strategy for prolonging aptamer circulation half-life and enhancing their biostability. However, a recent report showed that the in vivo use of PEGylated aptamers induced production of anti-PEG antibodies,121emphasizing the need for the development of alternative approaches. (v) The last important point to consider is whether aptamer-mediated biotherapies can become effective, FDA-approved medications. Following Macugen approval by the FDA, many aptamer-mediated biotherapies have been evaluated in clinical trials. Of particular interest is AS1411, an antitumor aptamer that has completed several Phase I clinical trials.15 Trial results are promising and offer useful insights into further modifications that could be applied to therapeutic aptamer development. Taken together, although some technical challenges remain to be addressed, oligonucleotide aptamers have become an attractive and promising tool for targeted cancer therapy. As more clinical data are accumulated, we and others will be better equipped to optimize aptamer formulations, leading to the expansion of aptamer use in the clinic. From bioimaging to drug delivery and therapeutics, nanotechnology is poised to change the way doctors practice medicine. Continuing improvement in the pharmacological and therapeutic properties of drugs is driving the revolution in novel drug delivery systems. In fact, a wide spectrum of therapeutic nanocarriers has been extensively investigated to address this emerging need. Accordingly, this article will review recent developments in the use of nanoparticles as drug delivery systems to treat a wide variety of diseases. Finally, we will introduce challenges and future nanotechnology strategies to overcome limitations in this field. Nanotechnology involves the engineering of functional systems at the molecular scale. Such systems are characterized by unique physical, optical and electronic features that are attractive for disciplines ranging from materials science to biomedicine. One of the most active research areas of nanotechnology is nanomedicine, which applies nanotechnology to highly specific medical interventions for the prevention, diagnosis and treatment of diseases. [1,2,401] The surge in nanomedicine research during the past few decades is now translating into considerable commercialization efforts around the globe, with many products on the market and a growing number in the pipeline. Currently, nanomedicine is dominated by drug delivery systems, accounting for more than 75% of total sales. Nanomaterials fall into a size range similar to proteins and other macromolecular structures found inside living cells. As such, nanomaterials are poised to take advantage of existing cellular machinery to facilitate the delivery of drugs. Nanoparticles (NPs) containing encapsulated, dispersed, absorbed or conjugated drugs have unique characteristics that can lead to enhanced performance in a variety of dosage forms. When formulated correctly, drug particles are resistant to settling and can have higher saturation solubility, rapid dissolution and enhanced adhesion to biological surfaces, thereby providing rapid onset of therapeutic action and improved bioavailability. In addition, the vast majority of molecules in a nanostructure reside at the particle surface, which maximizes the loading and delivery of cargos, such as therapeutic drugs, proteins and polynucleotides, to targeted cells and tissues. Highly efficient drug delivery, based on nanomaterials, could potentially reduce the drug dose needed to achieve therapeutic benefit, which, in turn, would lower the cost and/or reduce the side effects associated with particular drugs. Furthermore, NP size and surface characteristics can be easily manipulated to achieve both passive and active drug targeting. Site-specific targeting can be achieved by attaching targeting ligands, such as antibodies or aptamers, to the surface of particles, or by using guidance in the form of magnetic NPs. NPs can also control and sustain release of a drug during transport to, or at, the site of localization, altering drug distribution and subsequent clearance of the drug in order to improve therapeutic efficacy and reduce side effects. Commercialization of nanotechnology in pharmaceutical and medical science has made great progress. Taking the USA alone as an example, at least 15 new pharmaceuticals approved since 1990 have utilized nanotechnology in their design and drug delivery systems. In each case, both product development and safety data reviews were conducted on a case-by-case basis, using the best available methods and procedures, with an understanding that postmarketing vigilance for safety issues would be ongoing. Some representative examples of therapeutic nanocarriers on the market are briefly described in Table 1. In this review, we focus mainly on the application of nanotechnology to drug delivery and highlight several areas of opportunity where current and emerging nanotechnologies could enable novel classes of therapeutics. We look at challenges and general trends in pharmaceutical nanotechnology, and we also explore nanotechnology strategies to overcome limitations in drug delivery. However, this article can only serve to provide a glimpse into this rapidly evolving field, both now and what may be expected in the future.